This course will be taught through Zoom video-conference, where you can participate by computer, and see everyone in the class. You can also participate by phone. 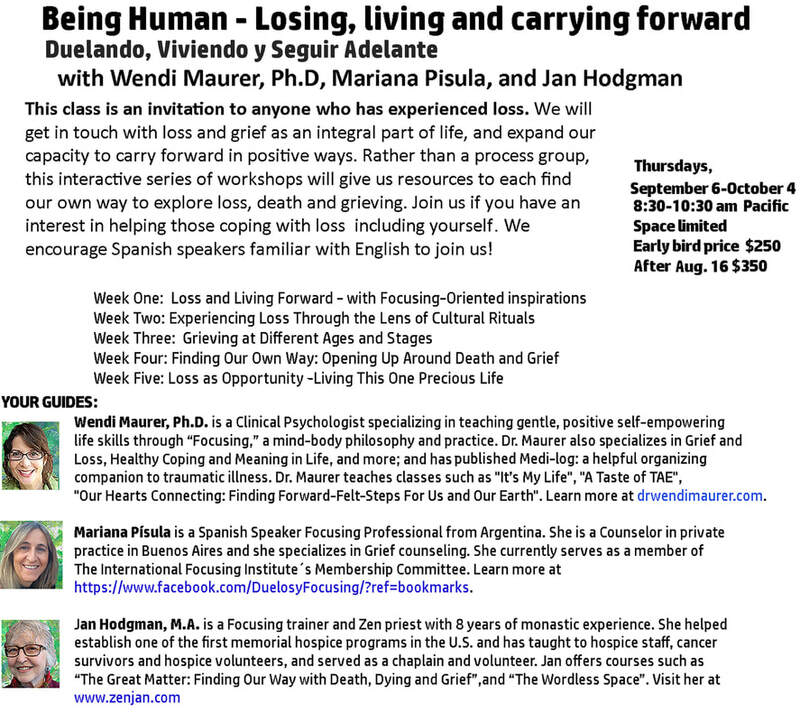 Part of the offering of this class will include an interactive website only for participants with many resources and ways to connect and share with each other. Thank you, Joe Coletti, for putting this together for us! This class will have a different topic each of the 5 weeks. There are no prerequisites for this course. Come as you are! We encourage Spanish speakers familiar with English to join us. Mariana can assist. Registration is complete with your payment. Payment information follows:. - Earlybird: $250.00 for 5 classes, paid in advance, After August 16: $350.00. - A percentage will go to The International Focusing Institute. - Or send your check to: Wendi S. Maurer, Ph.D.
- Please note "Carrying Forward" on your check. Need more information? Call or email 619.701.7999. carryingforward@gmail.com.